The 'Report Editor' enables you to create and edit reports and report templates. Using the Report Editor, you can build reports that are engaging on screen and effective when printed on paper. Best of all, if you plan on reusing a custom report, you only need to design that report once! The Report Editor has two viewing modes; 'Edit' and 'Preview'. You can toggle these modes in the top right of the screen. Sections help to organise and structure your report content into different views. You can quickly navigate between sections using the menu bar in the top left. To create a section, click on the 'three-line icon' in the top left corner of the editor and click 'New Section'. Creating a section break can be achieved by adding a blank section as detailed above, or by adding a 'Section Break' from the content library. This is found under the 'Text' category. You will then be prompted to select the orientation of the page. Reminder: the orientation of a section cannot be changed after creation. 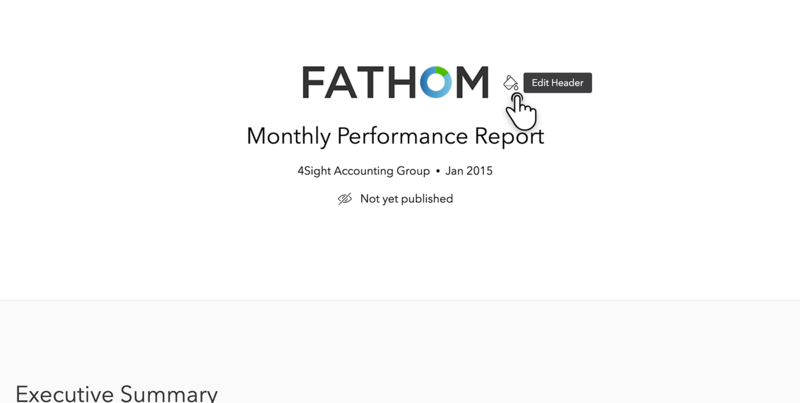 To delete a section, find the section title in your report and hover over it to expose the three-dot icon. From the drop-down menu, select 'delete section'. You are able to merge 2 sections together, by deleting the section break that separates them. To do so, hover your mouse over the section break line. On the right hand side, you will see a 'Bin' icon. Click this to delete the section break, and merge the two sections together. Note: Merging 2 sections can only be achieved if both sections are the same orientation. When you first enter the editor, you will be prompted to ‘Add a chart, table, or layout’. 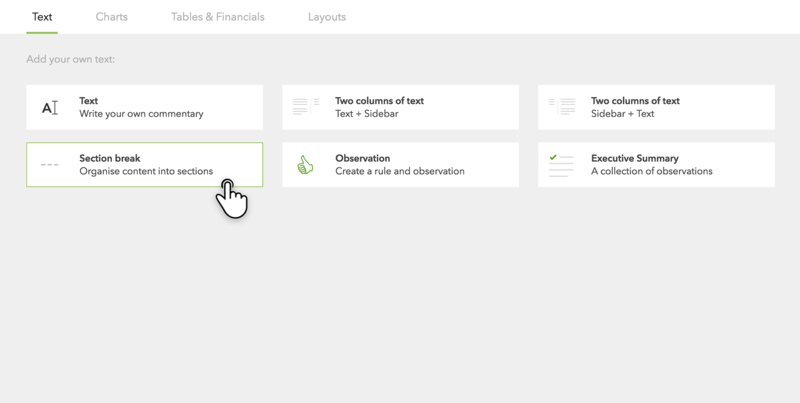 This takes you to the content library where you can choose charts, text, and other visuals to add to your report. 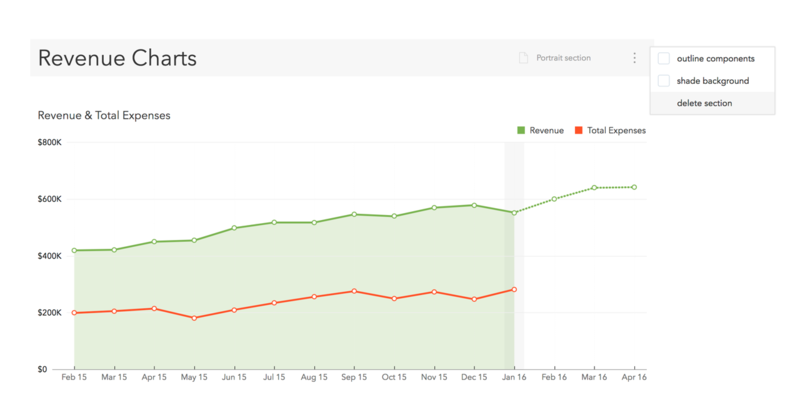 In the Report Editor, you can white label your reports with your company or client branding. The report heading is the 'Title Page' of the report. Edit the background image, logo and text alignment in the header by clicking the paint can icon. If you intend on printing the report, be sure to adjust both the ‘Online’ and ‘Print’ settings to add background images, logos, and designs. When you're ready to publish your draft report, select the 'Publish' icon in the bottom left of the editor. You can then select whether a notification email is sent to those the company is shared with. When viewing reports, readers can add their own comments or feedback directly into the reports. This can be done by clicking on the 'comments' icon when in view mode, for a published report. Additionally, anyone with access to a draft report can add comments when in preview mode.